The Integrated Reasoning section of the GMAT™ exam consists of 12 questions. Almost all question formats require multiple responses. Questions are designed to measure how well test takers integrate data to solve complex problems, so they must answer all parts of a single question correctly to receive credit. 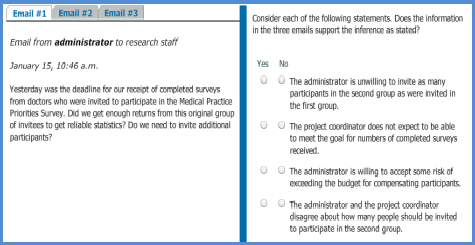 All answer choices for a single question are presented on the same screen. Test takers may not go back to a previous screen to change their answers to previous questions. Data presented in text are approximately 300 words or fewer. Answer options don’t provide information or clues that will help you solve other questions. One set of data is used for several Multi-Source Reasoning questions, but the questions are independent of one another—test takers won’t have to answer one question correctly to be able to answer another. For interactive samples of the Integrated Reasoning question formats, click on each of the graphic images displayed in the tabs below. Test takers are presented with a sortable table of information, similar to a spreadsheet, which has to be analyzed. Each question has several statements with opposite-answer options (e.g., true/false, yes/no), and test takers click on the correct option. To sample a Table Analysis question, click on the image below. Ashok Sarathy, Vice President of Product Management, gives a brief overview of the table analysis section. 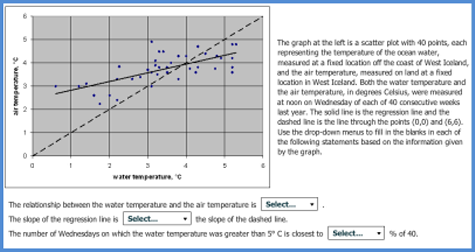 Test takers are asked to interpret a graph or graphical image. 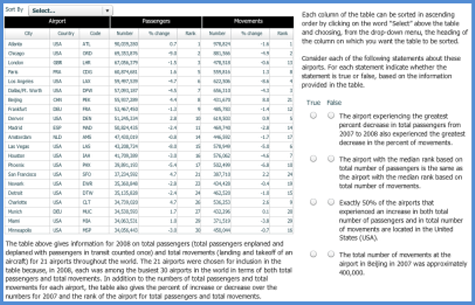 Each question has fill-in-the-blank statements with pull-down menus, and test takers must choose the options that make the statements accurate. To sample a Graphics Interpretation question, click on the image below. Ashok Sarathy, Vice President of Product Management, gives a brief overview of the graphics interpretation section. These questions are accompanied by two to three sources of data presented on tabbed pages. Test takers click on the tabs and examine all the relevant data─which may be a combination of text, charts, and tables─to answer either traditional multiple-choice or opposite-answer (e.g., yes/no, true/false) questions. To sample a Multi-Source Reasoning question, click on the image below. Ashok Sarathy, Vice President of Product Management, gives a brief overview of the multi-source reasoning section. A question involves two components for a solution. Possible answers are given in a table format with a column for each component and rows with possible options. Test takers have to choose one response per column. To sample a Two-Part Analysis question, click on the image below. Ashok Sarathy, Vice President of Product Management, gives a brief overview of the two-part analysis section.